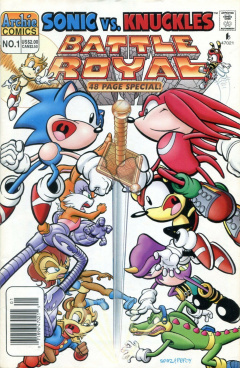 "Sonic Vs. Knuckles - Battle Royal"
Sonic Super Special 1, Sonic Vs. Knuckles - Battle Royal is the first Sonic Super Special published by Archie. It includes two stories: "Battle Royal!" and "The Map". With Dulcy flying in the lead, Antoine pilots the Freedom Fighter's plane, with the Freedom Fighters in tow, to Knuckles' mystical Floating Island. With Knuckles successful in his quest to acquire the Sword of Acorns on his quest, the group are now on their way to pick it up in hopes of helping the King in his crystallized state. However, in the report Knuckles gave Rotor, he also stated that the island was under siege. As Knuckles had helped the Freedom Fighters on numerous occasions, Sally Acorn thought it would be best to aid him as well. Antoine lands the plane, and after a long expedition, the Freedom Fighters fail to locate Knuckles or any battle. Suddenly, they are confronted by the Chaotix, minus Knuckles, who claim to have defeated their invaders with the Sword of Acorns. Vector goes about to even state that Knuckles has given them orders to send the Freedom Fighters packing without the Sword. Sally is curious why Knuckles wouldn't follow his vow to hand the sword over, but Sonic isn't surprised that Knuckles would give such an order. On that word, Mighty steps in, grabs a tree trunk, and attempts to hit Sonic with it. Sonic's speed gets him out of the way, just in time, while the other Chaotix step in to battle. Espio attacks Bunnie, while Charmy's flying skills send Tails into a confused state. Vector jumps at Rotor, but Rotor only wishes to find Knuckles and talk the issue out. Sonic and Bunnie, on the other hand, are fine with fighting the Chaotix, but Sally would also prefer a non-violent solution, demanding them to use minimal force. With that said, Tails tries to attack Charmy, so Dulcy flies in, stopping the two from getting to each other. Rotor, on the other hand, uses grenades to cover Vector in a sticky glue. With their efforts hampered, Mighty calls out to Archimedes, as the Chaotix all vanish into mid-air. With the battle complete, the Freedom Fighters contemplate what has happened. Sally still doesn't believe that Knuckles would go against a vow, while Dulcy believes everybody on the island to be wacko. Sally intends on remaining on the island to determine what is up, and to get the Sword. They all head out, ready to get some answers. With the battle complete, the Chaotix walk along the forest, wondering why the Freedom Fighters threatened them and abandoned the fight early. While contemplating the situation, Archimedes appears in Knuckles' hands, startling him. He informs Knuckles that things aren't as they seem, as the Freedom Fighters, now as a whole again, confront the group wanting answers themselves. It isn't long until the whole group gets into a brawl, except for Archimedes, who leaves the battle, and Sally, who tries to stop them from fighting. Despite her words, both groups continue to fight, with Tails going up against Espio and Bunnie against Mighty. Rotor, meanwhile, uses smoke bombs to deal with Vector. Dulcy is left to deal with Charmy, but he distracts her, sending her into a dive bomb toward the ground. Sally can't watch as she falls from the sky, but right as she hits the ground, Archimedes appears in Sally's hands, saying that the situation needs cool heads to think of a solution. Sonic and Knuckles, meanwhile, are duking it out, sharing insults with each other. The fight goes for so long that they eventually tire out, resting against a tree. Before round two can start, Sally runs over, stating that their fun and games are over. She grabs NICOLE from the ground, still clutching onto Archimedes. This confuses the Chaotix, but the battle continues, while Dulcy, back and active, chases Charmy around. Archimedes telepathically communicates with Charmy, asking him to lure the Dulcy toward him and Sally. Charmy is unsure why, but he does so anyway. Dulcy quickly approaches the two, while Archimedes starts up his plan. He lets out a huge breath of fire, as does Dulcy, causing the fire blast to collide. The collision causes a massive explosion; leaving behind a huge crater...and nobody in sight. ...as the Freedom Fighters and the Chaotix, alive and well, fly in and attack. Although this surprises Mogul, he orders the Fearsome Foursome to attack, but they are easily taken out by the strong force of the Freedom Fighters and Chaotix together. With the group out of the way, Knuckles and Sonic confront Mammoth Mogul, who, despite still being surprised, keeps his authoritative stance, wondering how the group survived. Sally steps in, describing what they did. With Archimedes, she developed a plan. While Sonic and Knuckles were resting from their battle, she told the two about the likelihood of another enemy watching them, using NICOLE to help them. Knuckles continues, mentioning Archimedes telepathic conversation with Charmy, which, with Dulcy in the know as well, helped to start up phase two of the plan: the explosion. Before the explosion, Archimedes used his abilities to teleport everybody away, allowing them to hide and learn who exactly was involved: Mammoth and his men. However, Mammoth still wonders how Sally and the others knew something was fishy. Sally claims that Mammoth didn't do his homework, as the fake 'Mighty' said that the power of Archimedes would allow them to escape, though they all know that Archimedes can only teleport somebody he is touching. Espio and Bunnie go to explain how the fake 'Bunnie' messed up, using the organic arm to throw boulders instead of the robotic arm. Knuckles also explains that, while he was fighting Sonic, he noticed that the fake one couldn't match the speed of the fast hedgehog, which he had battled numerous times in the past. Tails and Charmy even get into the argument, wondering why the number of Chaotix and Freedom Fighters that fought didn't equal the actual number that there are. Lastly, Sonic states that the fake Mighty attacked him first, when the real Mighty would've talked first or even said a quick hi before attacking, as Mighty claims that the two are old buddies. Mammoth Mogul is enraged at his failure, slamming his large cane into the ground, cracking and shaking the ground. Although this disorients the group for a short period of time, Sonic yells out to dog-pile Mogul. They attempt to do so, but Mogul's power, with his Chaos Emerald-powered cane and the Sword of Acorns, prove to be too much. They file in on Mogul again, finally getting in enough to hold him back from using the Sword or his cane, while Sally believes the Sword has increased his power immensely. Archimedes reappears on the battle field, carrying the spare Chaos Emerald from the island. He levitates it up toward Mammoth Mogul, causing the Chaos Emerald in his cane to get attracted to it. He can't control the reaction, as they attract, releasing a massive explosion. The Freedom Fighters and Chaotix, surviving the blast, look at the result: a smoking crater with Mammoth Mogul nowhere to be seen. Knuckles commends Archimedes for his quick thinking, but he wasn't even sure if it would work. Knuckles then turns his attention to the Sword of Acorns, which has landed on the ground beside the crater. Keeping his vow, he hands the Sword over to Sally. She takes the Sword, and following her royal heritage and to reward his for his heroism in acquiring the Sword, she officially knights him, proclaiming him Sir Knuckles. Despite this seemingly good news, back on the Floating Island, a mysterious fog appears again, cloaking a familiar large being. The being claims the Freedom Fighters to be fools, and that he had manipulated every event that had occurred that day. The Sword of Acorns appears through the fog, which the being claims is the real one. The fog disappears, revealing Mammoth Mogul, who laughs that his master plan will now be able to come to completion. Antoine rummages through a bunch of trinkets and items left behind by his late father, who he wishes was still around to help them out, and so that he could make him proud. He finds a picture of the Freedom Fighters when they were younger, and when his father was still alive, amazed that even after all these years, they have survived against Robotnik's efforts. He looks in the hilt of his father's sword, finding a map. He wonders if it could lead to the means to defeat Robotnik, but he has no idea what it is, or where it leads to. Bunnie Rabbot then jumps into the room, wondering what Antoine is doing being cooped up in a hut on a nice day. Antoine turns around, furious at the interruption, telling her that it is nothing that is to be of a concern. Knowing when she is not wanted, she walks out of the room in a huff to find something to do. Turning back to the map, he knows that it must lead to something special, but half the map is missing, so he believes he can use the one half to find the second. Taking his father's sword as his own, he decides to go to Robotropolis alone, apologizing to Bunnie later on for his retort. In Robotropolis, Snively is also rummaging through a bunch of notes in one of Robotnik's office. Wanting to get rid of his Uncle once-and-for-all, he believes he may be able to find something to do the job. He comes upon a ripped map which reveals a location called the Budding Circle, which he has never heard of before. He types it into the computer, smiling with glee as he finds that it is located in Robotropolis, and is the home of Robotnik's Krudzu creation; mechanical plants. Back in Knothole, Antoine dons some military gear while he briefs himself about the mission. He realizes that the X on his map leads to a place called the Budding Circle, where Robotnik had developed the Krudzu mechanical plants, but the weight of the plants caused them to collapse into the earth. The Krudzu, upon being used against the Great Forest, were also found to be immune to water. Putting on a beret, he believes Budding Circle to still be home to the Krudzu, or even something more powerful. With 1 half of the map, he will only be able to get within a mile of the Circle, then he will have to find it himself. He takes out a map of Robotropolis to determine the best way in, then wonders if he should tell Sally about the mission. Believing that his report would be incomplete if he did so, and his father's words, he decides that he best not until he has complete information. Thus, he storms out of the hut, intent on going alone. Following the map, Snively enters the south-side of Robotropolis, which he considers to be too smelly for his tastes. He arrives at the marked location on the map, bringing along his own group of eggrobos to dig for the Krudzu. While they dig, he daydreams of finding Krudzu seedlings to be able to destroy Robotropolis, but finds that the eggrobos are working too slow. Not far from the dig, Antoine arrives in the city from a sewer. He hears the commotion of Snively yelling at the eggrobos, so he walks over and investigates. While Snively continues to berate his minions, Antoine is quick to notice that Snively is holding onto the second half of the map. He then starts to wonder if the map really does lead to the Krudzu, since there would be no reason for his father to have a map leading to such a thing. He rolls the map up, finally deciding to tell the others. He prepares to leave, but accidentally hits a bunch of piping, sending him falling and creating a racket that is quickly heard by Snively. He orders three of his eggrobos to investigate while the other continues to dig. Antoine runs away, but the eggrobos are quick to notice him and start attacking. He thinks he is a goner as they take aim, but he is able to jump back into the sewer, just as they fire on him. Antoine gets up in the smelly sewer, wondering where he put his locator, but can't find it as he wore pants with so many pockets. He eventually finds it, though it is covered in sewer slime. He tries to get it to work, while the eggrobos detect him through the ground. They fire into the ground, opening a hole big enough for them to enter the sewer, forcing Antoine to duck for cover, unable to think of a witty remark like Sonic would. Although all hope may look lost, Antoine takes a power ring out of his backpack, hoping it can work for him like it does for Sonic, as the eggrobos take aim. He runs aside, hiding in an alcove, hoping the ring will work. The eggrobos come around, as Antoine jumps out and attacks with the ring itself, cutting one of the eggrobos in half with it, stopping the other eggrobos temporarily. Walking away from the scene, Antoine hopes he can get a few seconds of rest, but the other eggrobos are quick to recover and find him by blasting through a wall. He gathers up energy and runs along the sewer, eventually reaching a fork in his path. He reaches into his backpack again, taking out a triangular object, which he hopes will work. He places it on the ground and hides in one of the sewer paths. As the eggrobos reach the scene, he activates the object, which creates a holographic image of two Antoines escaping via both paths in the sewer. This confuses the eggrobos to the point of overloading, finally giving Antoine the chance to escape. He arrives at Uncle Chuck's hide-out, where he tries to update him on the map and Snively, but he goes too fast for the old hedgehog, who asks him to slow down. Uncle Chuck, however, tells Antoine that the others were wondering where he went, and were afraid that he got caught by Robotnik. Antoine ignores him, showing him the map instead and describing the eggrobos and their power. Uncle Chuck had recently received a report from Rotor about seismic activity in that area, so Sonic and Bunnie were sent out recently to check it out after Antoine had left. Realizing that they could be in trouble, Antoine gives Uncle Chuck the map and leaves the hide-out in haste. Taking the sewer again, Antoine arrives at the dig, only to find Sonic, Bunnie and Rotor under attack by a whole squadron of Snively's eggrobos. Rotor has been hit by one of the eggrobos, while Bunnie can't hold them off. Antoine rushes into the battle, taking out the ring and passing it over to Sonic. While Bunnie continues to hold the horde off, Sonic uses the ring to get over to Rotor to help him out. He tends to Rotor, as Antoine enters the battle with a large gun to aid Bunnie. However, despite their efforts, SWATbots arrive and attack. Bunnie starts to run out of power, and despite Rotor and Antoine having guns, and Sonic's speed, they find their efforts to be failing. Despite the odds, Antoine notes that they must continue fighting...until they all notice the eggrobos and SWATbots ceasing their attacks and flying away. Not wanting to wait around and see what happens, the group decide to leave the area while they can, despite the uncharacteristic retreat of the bots. They enter the sewer, just as Robotnik arrives on a floating ship, with the SWATbots guarding. Robotnik storms out of his ship, demanding to know why he got an anonymous call that Snively had built attack robots more powerful than his own. Snively, hiding in dirt, pops up, saying they are his digging robots. Robotnik, however, is more concerned about the robots, wanting to know if they had been destroyed. Snively makes up a story, nervously, on-the-spot, saying he was testing a toxin that could level a forest, when the Freedom Fighters destroyed his digging robots. Robotnik, angry that the Freedom Fighters destroyed more powerful robots that he could've used, pleads that they will pay for what they've done. Back in Knothole, during the sunset, Antoine looks at the map, thankful that Uncle Chuck called Robotnik about Snively's robots, and that he'll have to find out the mystery of the map another day. Although this special issue was officially released after issue 48, this issue takes place between issues 46 and 47. This is the first issue to have a story written by Tom Rolston. The Krudzu, mechanical plants, return, last seen and introduced in issue 1. This page was last edited on 28 March 2019, at 17:32.